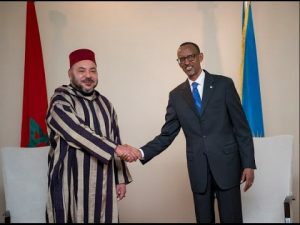 Morocco’s King Mohammed VI and Rwanda’s Paul Kagame have voiced their shared determination to build up a strong partnership between their two countries, based on the promotion of South-South cooperation and consolidation of inter-African solidarity. A joint statement made public Sunday at the end of the Moroccan King’s state visit to Rwanda pointed out President Kagame commended the Moroccan King’s leadership and his contribution to promoting peace, stability and development in Africa. President Kagame underlined, in this regard, “the dynamism of the Kingdom’s African policy, which combines political involvement, development of economic relations, promotion of human ties and security cooperation,” the joint statement said, adding that the Rwandan President also paid tribute to Morocco’s key role in promoting sustainable development. He expressed support for Morocco’s efforts to make of COP22 a successful event, the document stated. King Mohammed VI on his part expressed his appreciation for the active role played by Rwanda at the regional and continental levels, and congratulated President Paul Kagame for his commitment to peace and stability in Africa, the statement said. At the bilateral level, the two heads of state welcomed the new strong impetus given to the two countries’ political relations and agreed on concrete actions to boost a diversified and mutually beneficial bilateral cooperation. The two leaders, who have converging visions on socio-economic development, voiced resolve to endeavor for the establishment of a strong partnership, based on South-South cooperation and on experience and expertise sharing, the joint statement said. The document added that the Moroccan King’s official visit crowns the positive development of bilateral relations witnessed in recent years, and illustrates the two leaders’ determination to strengthen ties of friendship between the two countries and at the same time promote regional integration and the African continent’s Renaissance. During his state visit, the first of its kind in Rwanda, King Mohammed VI expressed his country’s determination to upgrade its cooperation with Rwanda to the highest level, to diversify its partnerships in the continent, to be more open towards East Africa, and to extend to this region the model of South-South cooperation that the kingdom has developed with its African traditional partners, states the joint statement. The two leaders, who also agree on the role of the private sector in promoting bilateral relations, have urged economic operators of both countries to set up win-win partnerships. They likewise convened to endeavor so that the two states defend their mutual interests at regional, continental and international levels, the joint statement says. After his visit to Rwanda, King Mohammed VI arrived on Sunday in Tanzania, second leg of his current African tour that will also take him to Ethiopia. As was the case in Rwanda where the Sovereign chaired over the signing ceremonies of some 23 agreements and MoUs, the trip to Tanzania will highlight by the signing of several cooperation agreements in the fields of finance, agriculture, tourism, training, investments and electrification. Written by: Peter Mulvany on October 23, 2016. Posted by Peter Mulvany on Oct 23 2016. Filed under Headlines, World News. You can follow any responses to this entry through the RSS 2.0. Both comments and pings are currently closed.